Steve Ballmer from Skype (or is he from another company ;-) told the World that there were 300 billion minutes of Skype calls in 2011. I added the data to my “historical” graph. 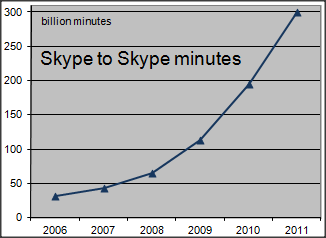 He also speaks about 200 million people who used Skype in 2011. The last number is probably still an exaggeration compared to the actual real users (some people test Skype and never use it again) but a much better indication than the number of “user accounts” that Skype used to publicize in the past calling it “users”!